After being wrongly accused of murdering a barfly, Terri Smith (Mary Beth Hughes, The Ox-Bow Incident), an ex-Marine, James Henry (Richard Conte, House of Strangers), flees from the police. 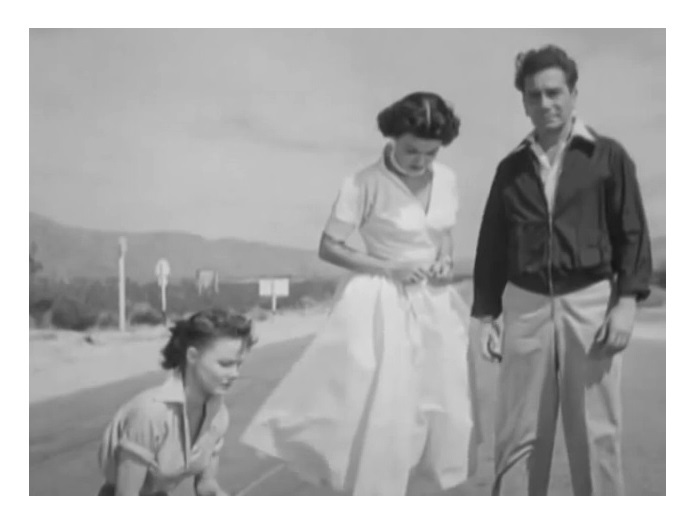 Sometime later, the fugitive kidnaps a photographer, Mrs. Cummings (Joan Bennett, Father of the Bride), and a model, Susan Willis (Wanda Hendrix, Ride the Pink Horse), while the cops are hot on James’s trail. “SHOCK AFTER SHOCK … in manhunt for Las Vegas thrill-killer!” Gosh, you gotta love old movie taglines! 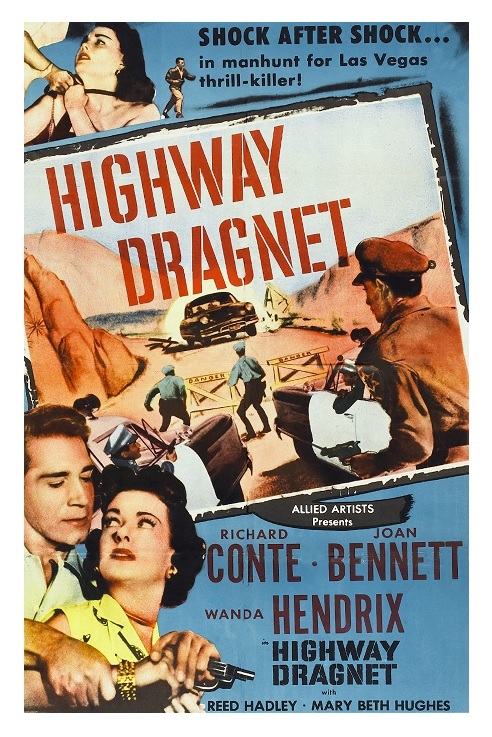 Although Highway Dragnet is neither shocking nor thrilling, this is an entertaining B-movie — an enjoyable trip into the nightmarish world of noir. 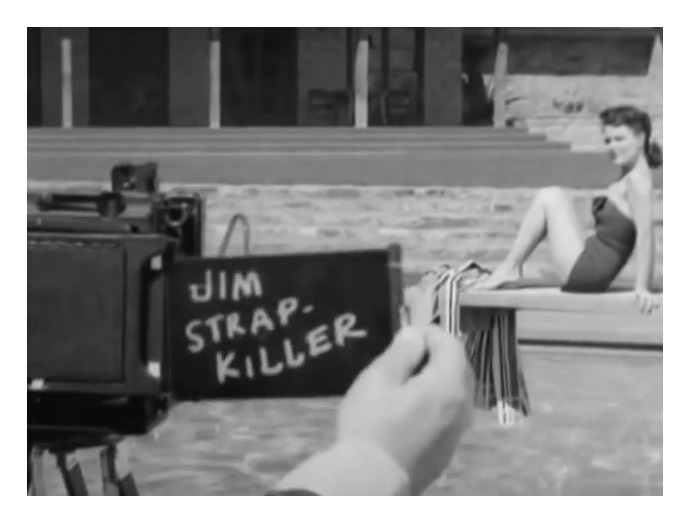 Today, Highway Dragnet is mostly remembered for being Roger “King of B-movies” Corman’s very first movie as a producer. He also received credit for the original story. He had written the first draft and offered to work on the movie for nothing in exchange for a credit as an associate producer. He used the opportunity to learn the technical aspects of filmmaking. Corman also used the money from the screenplay to finance his very first solo production, and the rest is history. Highway Dragnet, directed by Nathan Juran (The 7th Voyage of Sinbad), written by Jack Jungmeyer, Herb Meadow, and Jerome Odlumis, a pretty good little movie. The story is simple and the narrative moves fast. My only issue with the film is that the whole thing is a bit far-fetched. But hey, this is how the world of B-movies operates. Unlike Corman’s later films, this one uses established actors in the leading roles. Conte is terrific and while Bennett’s character doesn’t make much sense, she is always a nice addition to any movie. Interestingly, the movie’s original title, The House in the Sea, was changed to capitalize on the then popular TV show Dragnet, starring actor Jack Webb. I said interesting because I’ve always thought that Webb and Conte look like brothers. Highway Dragnet is short and fun, and as it tuned out, quite important — it gave one of American cinema’s most influential figures his first big break. Corman is responsible for giving lots of people their first big break. Imagine this: no Highway Dragnet … no Jack Nicholson, Joe Dante, no Francis Ford Coppola, no Martin Scorsese, no Jonathan Demme, no James Cameron … terrifying, isn’t it? B&W, 70 minutes, Not Rated.